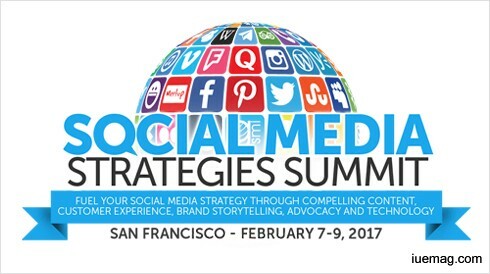 Join the Social Media Strategies Summit - Chicago on April 16-28, 2017 at Union League Club of Chicago. Since 2010, the Social Media Strategies Summit has been the #1 conference choice for social media, digital marketing and communications professionals across all industries. SMSS offers the latest in social media, content marketing and technology trends with exclusive access to leading brand case studies and award-winning speakers. Attendees leave with actionable takeaways in marketing strategy, ROI, analytics, employee & brand advocacy, social selling, technology, and much more. Featured brands include: GE Digital, Coca-cola, Kraft-Heinz, Walt Disney Company, Toms, HP, World Bank, US Bank, DocuSign, Nestle, Miller Lite, American Family Insurance, and Symantec. - Learn from a mix of experienced in-house practitioners and award-winning agencies to get a 360° view on what it takes to execute a successful, revenue-driving social media strategy. Each speaker is dedicated to bringing real-word, applicable knowledge to get you thinking out of the box and generating winning ideas for your campaigns. - Engage in interactive sessions with clear, actionable frameworks and takeaways..
- Leverage practical, tangible strategies to differentiate your brand in a crowded marketplace. - Strategically integrate social media tools to run more effective, engaging campaigns. SMSsummit will help you master best practices in integrating social media into your broader content, digital, and traditional media strategies. - Meet other organizations with challenges just like yours — and learn how they are overcoming them. - Build your social presence through a strategic balance of organic and paid media optimization. - Learn best practices in quality content, storytelling and video production that inspire consumer action. - Stay in-the-know with the latest social media channel and consumer behavior trends. - Translate social data into insights to help you build a seamless customer experience across channels. - Generate fresh, winning campaign ideas by learning from case studies outside of your industry. - Connect and have conversations with the speakers and brands that inspire you most. - Engage in interactive sessions with clear, actionable frameworks and takeaways. - Learn best practices to leverage emerging social channels and stay ahead of the curve. - Benefit from a rich, diverse mix of senior-level executives. Get out of your industry bubble to see what others are doing to succeed at different types of companies which can inspire innovation at your own. There’s more to it. Witness them all at the Social Media Strategies Summit on April 26-28, 2017 at Union League Club of Chicago. The iUeMagazine team is delighted to work with Social Media Strategies Summit as Online Media Partners & is expected to bring Unlimited Inspiration for all readers from the proceedings of this event. Staying tuned to the enriching updates from this event is recommended.